Jim Lemon personally hand signed these Rawlings official American League baseballs. Each autographed baseball includes an individually numbered TRISTAR Authentic hologram. 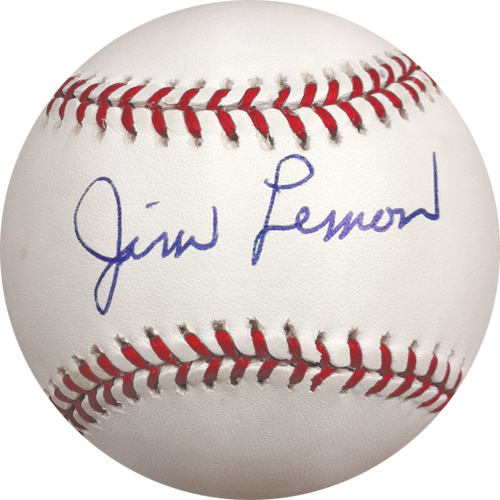 Jim Lemon was an outfielder for the Washington Senators/Minnesota Twins from 1954 to 1963. During his time with the Senators, he and Roy Sievers formed one of the most intimidating home run-hitting duos in Senators history. He became a favorite of President Eisenhower, who attended Lemon's 3-home run game in 1956. Lemon, a 2-time All-Star, hit 27 home runs in 1956 and also led the league in triples. Lemon passed away on May 14, 2006.